I was really looking forward to finally starting All That Glows. I had been swooning over the gorgeous cover for some time, and I couldn’t wait to check out the story. Before I begin this review, I want to clarify that the characters of the royal family in this book are completely fictional. There are some references to actual kings and queens in history, but Prince Richard and his family are, in fact, fictional. This is not about any prince/king in history. Emrys is a centuries old Fae, a member of the Faery Guard, a group of fae that are sworn to protect Britain’s Royal Blood at all costs. 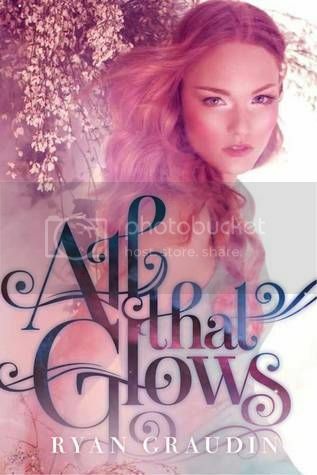 When Emrys is set with the task to discover who is threatening to kill her newest assignment, Prince Richard, party-boy extraordinaire, she discovers that things are not always what they seem, and that there is more to life than just magic. Emrys was a very interesting character. I didn’t really think that I was going to like her when I first started the book. She seemed a little cold and guarded. But over time as she interacts with Richard more and more, we see her become a completely different person, and definitely a more likeable person. Richard was definitely a party-boy in the beginning of the book. But was he a party-boy, or was he just looking for a way to forget all of the responsibilities that were on his shoulders? All that changes when Emrys comes into his life, and see him become a much better person under her influence. The storyline for the book was very interesting. I kind of like that the author mixed in some fiction with some facts. Books with historical natures are always interesting to me, and I always find myself researching what I’ve read in the book. I love reading about past kings and queens. I thought that the merging between the two worlds was pretty interesting; the fae world and the modern London. I read this book at a surprisingly quick pace; everything came together to make quite an interesting read. Overall; I found this book to be a quick, enjoyable read! I’m really looking forward to reading more by this author in the future. Sadly, I got kind of bored with this one and skipped to the end. At least there was an HEA! So glad you liked this. Me too. Emrys and Richard grew on me as characters as they grew through the story.